We compared six popular FTP Server applications for the Windows Platform. They were each assessed based on six features: the ability to backup users, bandwidth throttling, monitoring, virtual folder support, ODBC for the user database, and SSL capabilities. Description: BlackMoon FTP Server is an FTP daemon written specifically for Windows 2000/XP/2003 and above. It takes advantage of all the new features in the mentioned oses like io completion ports, thread pooling, running as a system service, using built-in SSL certificate stores, authenticating against an Active Directory or remote NTLM, accessing network shares, impersonating NT users and more. We selected six options that are not standard in all FTP software. Support was determined by usage and company website. We also included the pricing of the software at the bottom. Product pricing varies based on included features and the number of users supported. As you can see from the following matrix BlackMoon FTP, Serv-U, and Raiden FTP Software all support the full set of selected features. ODBC and bandwidth throttling support are recent additions to the new version 5.0 of Serv-U. Until they have further matured we cannot pass judgment. WarFTP is finally being worked on after its author took a 3-4 year leave. WarFTP was an excellent piece of software; however over time it has become obsolete. We hope to see an updated stable version, in the near future. Although Raiden FTP supports all of our selected features, the user management method seems to be designed for personal use and not an enterprise environment. So, for now BlackMoon has our blessings. One thing that sticks out about BlackMoon FTP is the main active monitoring screen. From here you can see the number or users online, current bandwidth, server uptime, and several other statistics. The default green colors of the status screen may not be your cup of tea; however, you can completely customize them. This is a major plus. 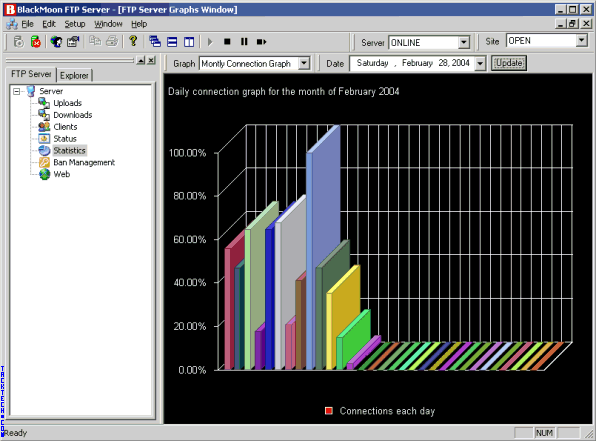 Another great feature included in BlackMoon FTP is 3D statistic graphing. From the initial look you see a percentage on the left hand. When you hover your mouse cursor over an item a graph showing the totals is displayed. Personally, we would switch this around. The percentages can be misleading. If the left hand graph were to show your data you would know how the other days compare. As a test we email support a couple times with questions. Most of them were answered within an hour. That's top-notch support. BlackMoon FTP Server includes all the features we were looking for in a FTP server plus many more. BlackMoon FTP is a well-suited application with robustness and quality built in. It installed easily, ran stable, handled large file transfers with ease at full speed, and flawlessly executed file resuming with multiple users connected.